“I wanted to become an actor,” says Iraqi author and poet Muhsin al-Ramli, “but I come from a conservative family. My father wouldn’t allow me.” Instead, he tells Middle East Eye, he opted for journalism and later started writing novels. 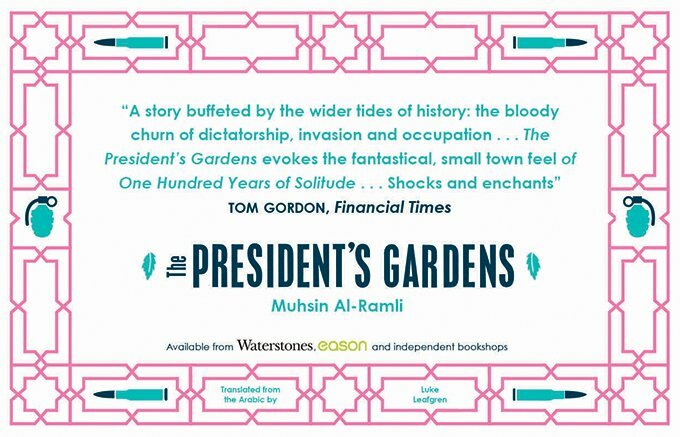 His latest novel,The President's Gardens, was long-listed for the 2013 International Prize for Arabic Fiction. His works have also been compared to the writings of Gabriel Garcia Marquez and Khaled Hosseini. Although al-Ramli has been living in Spain for the last 22 years, his personal life was scarred by the dictatorship of Saddam Hussein. His brother, Hassan Mutlak, a poet, was executed in 1990 for participating in a coup with a handful of officers. Mutlak's attempt to overthrow the government had repercussions for the whole family. In those years, Ramli was reluctantly serving in the army, as Iraqi law demanded three years of mandatory national service, and failure to do so meant jail. His feelings about the time he spent in the army comes through regularly in his writing: the humiliation, the sense of injustice, the fear of talking out of turn, loss; but also the comradery, like the one he had with his friend Ahmed al-Najafi. “He shot his own hand in front of me, so he could leave the army and return to his family, but they discovered him, they knew he did it on purpose and they threw him in jail,” he said. In 1993, al-Ramli travelled to Jordan to pursue a career in journalism. Yet his path in life was not easy there due to his status as an immigrant, and periods of unemployment, making it difficult for him to put down roots. “I refused to learn English,” Ramli confessed. “I couldn’t stand it, so I learnt Spanish because of the great literature produced in that language." Learning the language made it easier for him to study in Spain later and set up a life there. In 1995, Ramli applied to a university in Madrid and was accepted. moving to Spain. He pursued his studies until he obtained a PhD in Philosophy in 2003. For a while, times were hard. Upon his arrival, he only had $200 in his pocket and could not find a job; but with the help of a few friends, he managed to stay afloat. Then thanks to money coming in through translation jobs, in 1997, he set up one of the first Arab magazines in Madrid, Alwah. “This was also an excuse to grant my brother’s silenced voice a readership,” he said. and the machinery that minces souls and makes Iraqi meat. between the window and the poem. Since then Ramli has come a long way. He is now a professor of Arabic and literature at Saint Louis University in Madrid, a translator of Don Quixote from Spanish to Arabic, a poet, an author and a screenwriter. Ramli’s talent has also been acknowledged in recent years: the translation of his novel Scattered Crumbs by Yasmeen Hanoosh won the Arkansas Arabic Translation Award in 2003 and most of his novels have been translated into many foreign languages. Some of his poetry and screenplays, however, remain unavailable in English. Ramli was finally able to visit Iraq in 2004 following the fall of Saddam Hussein after the US invasion, and again in 2014. However on the second visit he could not return to his home in Baiji in northern Iraq as it was under the control of the Islamic State group. He hasn't visited Iraq since then. When asked about his native country, Ramli is clear in his convictions. For him, if there is one mistake that is often made about Iraq today, it is to forget its recent past. In 2006, Ramli’s family was decimated by a horrific event. He received a call from a family member in Iraq telling him that they had discovered nine banana crates, each containing a severed head, left near the family house. “It felt like a nightmare,” he said, “but it was real. My house … was close to the main road where the banana crates were left. Most of them were my relatives, killed on the third day of Ramadan 2006.” This episode is recounted in The President’s Gardens. There was a massive increase in the number of American troops in Iraq that year. This exacerbated an already complex sectarian divide. “Bananas are not native to Iraq,” Ramli explained, “the incident was strange, new and foreign …it occurred in conjunction with the invasion of foreign forces and with the introduction of many ideas, goods, interests and other foreign things. By this point even remote villages that had remained largely peaceful throughout the turbulent years could not be protected, he explained. "The dictatorship and the wars didn’t leave one place safe in Iraq; death and destruction affected every human being, tree or stone there." No to the party of military men on the roof of my house. or are going to propose. No to liberating Iraq from me or me from him. With all the turmoil that followed the US invasion, many questioned, and still do, whether life was better under Saddam, and if the bloodshed was necessary after all. “During the war, it was impossible to write, scrutinise facts, and with the sanctions on Iraq, things got worse," he said. “What happens in Iraq changes its history day by day, so it’s easy to lose the plot. Many of those young Iraqis who join ISIS ignore how we came to this situation." Ramli said he felt he needed to emphasise that it is easy to forget that Saddam was a criminal and question whether Iraq has learned from its suffering. This is how The President’s Gardens was conceived, as a narrative covering the past 50 years of Iraqi history. In his latest book, Ramli sheds light on the untold history of Iraqi prisoners of war in the Iraq-Iran war. “I dedicated two or three chapters to them,” the author said. “I talked about my meetings with the prisoners who came back from Iran. They shared information about their suffering. Not many books have highlighted the situation of the prisoners in the Iraq-Iran war in Arabic literature and the Iraqi novel,” he said. Ramli keeps writing about Iraq from a distance that is purely geographical, because his heart is still in Iraq. As a man who has experienced and seen war more than peace in his country, he is not optimistic about Iraq’s future. If there is one aspect that is missing in his writing, it is a discussion about sectarianism. “I personally never experienced sectarianism in my life. …My first teacher at primary school was a Yazidi from Sinjar and he was my dad’s friend, a religious man, and my teacher’s son was my friend … We had a Kurdish goat-herder in our household, and we used to love him very much," he said. "The sectarianism exploded and was exploited first by the dictator and then with the arrival of the Americans, and it has now pervaded the whole region. This is unfortunate, backward and silly, and a dirty game I refuse to play because it’s been put in place for greedy interests at the expense of human beings,” Ramli explained. While recording crimes and brutality, The President’s Gardens also includes humour, love and deeply touching moments. “I believe that Iraq was always like that and will remain riotous and unstable and radical changes will always happen. These are characteristics that have become part of its nature and of its being throughout history," he said. "This is Iraq: it was and will be troubled, hot, suffering, beautiful, astounding and vibrant forever," he added.